It is the goal of the San Andreas Police Department to protect the community of San Andreas by preventing crime, preserving safety and protecting life and property in a manner which displays both impartiality and the utmost respect for the rights of individuals. The San Andreas Police Department will strive on all levels to provide a superior, professional service to the people which we serve. This will be accomplished through ensuring that all department members are trained above and beyond the expectations of the citizens that we serve. Staff will maintain professional demeanor at all times from the way in which they present themselves in uniform, to the way in which they behave both on and off duty. Finally, staff are to maintain a relationship with the public that solidifies the historic tradition that the police are the public and the public are the police, the police being only members of the public who are paid to give full time attention to duties which are incumbent on every citizen in the interests of community welfare and existence. Officers have been given the honor and privilege of enforcing the law by accepting their badge and taking the oath to serve. Members must always exercise integrity in the use of the power and authority endowed upon them by the San Andreas Police Department and the people which they serve. The personal and professional behavior upheld by the San Andreas Police Department should be a model for all to follow. Members will obey and support the letter and the spirit of the law. The San Andreas Police Department will be a leader in law enforcement. Each individual needs to be a leader in his or her area of responsibility. Ensuring that the Department’s mission and values are followed ought to be a part of every individuals daily work life. All department staff will work to ensure that their co-workers, professional colleagues, and the community have the highest respect for them as an individual and the department they represent. 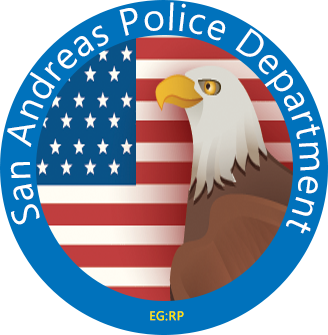 Members within the San Andreas Police Department are appointed to positions based on their competency for that position in addition to their commitment towards the betterment of the department as a whole. It should be understood that members are to follow any and all instructions given to them by ranking members. It should also be understood that ranking members shall not under any circumstances abuse their authority based on personal biases or beliefs, or use their position as a means to demean or degrade subordinate members. Members are required to abide by all relevant policy at all times.